No point in publishing documentation for offline use since they cant be updated when there is a chance. People will end up with outdated docs quickly. If you look at the roadmap the restructure isn't done yet (Under Prototyping). Thank you for answers, yes , I check roadmap every week , you are right , but I see a few news about cryengine, news is few , I love , I want more news of cryengine 5.5 and c# syntax. Is possible , we see add component c# at an entity? Just like unity component ? I checked lumberyard 1.11 , also lumberyard is like unity with add component panel with lua component , we can control every entity independent of a number of lua scripts to added. please here , If a person/persons of ce team know , please tell us more details of c# component/components at one entity , also please tell us more details about new docs in future , I understood here is a few shots of 2 news (last news) with WIP docs/pictures. Wait a sec... does it means CryEngine is going to be documented *for real* now?! Could some CryTek engineer make a blog post about the internals of the engine?! They are very easy to follow and very user friendly. No, it's not easy to follow nor user friendly. After downloading, he spends some time trying to find PIT_BLANK.cry, eventually he finds it at: ".\SAMPLE_v8\CONTENT_EXAMPLES\GameSDK\assets\levels\contentExample\PIT_BLANK\PIT_BLANK.cry", but then doesn't know what to do with it. So he can't process to follow the video and gives up. Maybe these tutorial is more user friendly than the past, I appreciate that you made an improvement, but you still need to push forward, imagine you as a newbie, not a familiar user when designing these beginner's tutorial. 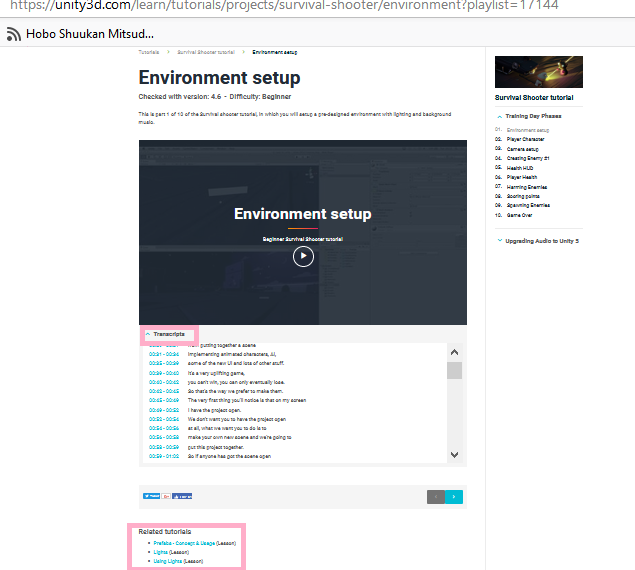 So I really hope that the tutorial can be like this Unity's tutorial for beginner: They give a project for the tutorial series (and update the project when it's outdated), they give the slide, they give the transcript for non-English speaker, they give related tutorials. 1. User take long download time. If you don't have time to break the big package now, at least give description (what is this, how to set up) for the content in the big package, but I still prefer small projects for each tutorial series. 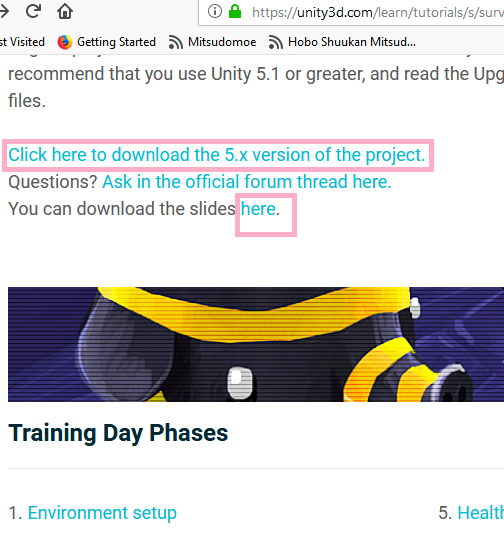 I see that the tutorials just starts out with the pre-setup scene (for example: https://youtu.be/GJDs5YxhgPU), how the user know what's that come from, so it should be a good idea to tell user in the video's description where user can download the tutorial project (I said project, not asset, project contains asset and project can be clicked and played). If you can't provide transcript for now, link the video from Youtube instead of Vimeo (don't get me wrong, I also love Vimeo, but I don't see Vimeo has auto-generated subtitle), so at least user has auto-generated subtitle. I see you've already uploaded your tutorial to Youtube. @HDN Thank you for taking your time to give us feedback. We do try to improve where we can so feedback is important to us. However there is something we would like to point out in regards to your comment. It is a fair point that the asset download is rather large and some things are not obvious, a single drag and drop into the GameSDK folder is the way to go right now which includes all the content examples. As for the rest we will forward it to the relevant departments. Step 1. Download the CryEngine. Step 3. Check the tutorial videos for interesting features. So when Jack sees the Getting Started videos, he tends to skip these videos, he likes: "Nah, I've already known how to do this in step 2! So skippy skip!". Therefore I think CryTek needs to design a small game for beginner tutorial like Survival Shooter, through this tutorial, you can teach the Getting Started tutorial, I hope you soon have information for the tutorial like this. What i find people are looking for are really coding in C++ with CryEngine. First of all: thank you very much for the efforts to provide learning materials. I‘ve got some thoughts here aswell. Before we start I should maybe spend a few words on my CryEngine experience up to now. I‘m using CryEngine for three years now. Currently I‘m still using the GameSDK (I‘m just used to it). It was sadly always hard to find out how to get stuff done. But I managed to get most things working properly. So I started with the editor, then I got into asset creation, ui, programming, e.t.c. By the way: I started with CryEngine because I really love CryTek. Maybe because I live near CryTek and they are the only big game studio around here. So basically I learned everything step by step. The problem here is that I sadly got some knowledge gaps everywhere, just because I couldn‘t find out how it‘s done. This is really driving me crazy, because I have already spend three years (multiple hours every day) on my project. It would be a personal tragedy to me if I can‘t finish it because of a lack of knowledge. So I‘m constantly checking the web for new leraning resources. But most of the time I‘m just dissapointed because no tutorial seems to really go into depth. People are just uploading 15 minute videos or writing a one-page-text. Everybody seems to be possessed by the idea of „if you really know a topic, you should be able to explain it in a short amount of time“. In my experience, complex topics can not really be broken down into a 15 minute video. And the official CryEngine tutorial videos aren‘t really explaining anything. The problem here is that they only focus on one thing and then just go on without creating any connection. It feels like getting a few pieces of a big puzzle and then you need to create the whole thing from these few pieces. I‘m sure that I‘m not alone here. Lot‘s of people are creating games and projects with CryEngine and are just getting stuck at some point. These people really need some in depth help. I‘m pretty sure that I‘m not the only one who thought about changing to Unreal or Unity multiple times. I just stayed with CryEngine because I love CryTek and because I‘ve already put so much love and effort into my project. Now here is the point that I want to make that leads me to a more precise description of what I want. The first thing is this: please don‘t be afraid of 3 hour+ videos. A lot of beginners may find this „not user friendly“ because then they really need to spend some time and effort to actually leran CryEngine (surprise). I sometimes get the feeling that many beginners just want some magic „create game“ button that solves all their problems. Now this would be really nice but sadly that‘s not how things work. The people who are really willing to develop a game are aware of the fact that they will spend a lot of time learning. A complex topic (like Gane Creation) can not be broken down into a tutorial series of 50 videos with 15 minutes each (so just 12.5 hours). You can‘t teach how to develop a game in this time. You know... that‘s just half a day. In half a day you won‘t get from newbie to pro. So please don‘t be afraid to take the time that is needed to teach a complex topic. And now finally to my wish for learning resources: I would love to see a complete project (not just a mini game) from scratch. Like really scratch. I think about a tutorial series that is split in two parts. The first part should cover all basic stuff. Here you got the beginners covered (and here you can really create 15 minute videos). So basically the starting point should be to get used to the editor and take a look at all the systems and tools that the editor offers (Like Flowgraph, Trackview, Material Editor, Particle Editor and all that stuff). Then you can go over to asset creation. To teach a good creation pipeline, I would suggest to show the creation of a static geometry, an animated geometry, a breakable geometry, a touch bending geometry, also vertex colors for different stuff (like vertex deformation or a texture blend layer), and finally a character. Really from start to the point where it is finally inside the engine. Of course LOD, physics Proxies and textures should be covered here also. Then you could show how to create other assets like sound, animations, UI, e.t.c. and get them into the engine. So after all of that, people should know their way around inside the editor and how to create and import all kinds of assets. Now here it is getting really interesting. Because now we need to really get things done. So I suggest that you create a series of videos where you create an entire project from start to finish. Yes, I know what that means. This means that we would start with code implementation with player, AI, weapon system, inventory system, networking, VR, and really everything else. Then we should get a charater into the engine and use it as player/ai. So we should also learn how to create a proper skeleton with IK, Ragdoll limits, physicalization and all that stuff. Now there should also be the mannequin setup with blendspaces, transitions, procedural clips, lookposes, aimposes, e.t.c. and maybe a weapon or two with a proper mannequin setup also. Furthermore some usable entities like buttons, levers, maybe also some kind of ledge (like in GameSDK), e.t.c. and in the end publishing the project with proper encryption, e.t.c. So basically an entire project from start to finsih with a small level. I know that this is really hughe, but there is a clear line that gets people through everything. So people would know about the editor, about asset creation, programming and how to combine all of this. Currently this connection is missing. But with this approach, people would really get an entire overview about game creation and they would have a starting point. So the tutorials would simply be „one after another“ and not divided into categories like „Level Design“, „Asset Creation“, „Programming“, e.t.c. I see why this seperation is done in current tutorials (also in Unreal Engine and other engines), but this speration results in an entire mess because nobody really knows whats going on. Everyone just gets a narrowed version of the entire thing. Well I think that everyone should really know the entire process before putting the focus on their specific task in the project. But sadly there is a downside to this approach. Creating such a big thing would cost a lot of time (which is to say that some people would be busy for a long time to create these tutorials. So this will be pretty expensive aswell). And a tutorial series like this would need some maintanance aswell, because it is pretty likely needed to be updated with newer engine versions (which again costs time). I know that this is pretty likely not going to happen. Creating an entire project from scratch is a really tedious and time consiming job. I know that I‘m basically asking for the creation of a basic GameSDK project. So to end this off, here is my long story in short: It is not enough to touch the surface of everything. Please give us an in depth knowledge about the cration of projects from start to the point where you can release them. We need to get every aspect covered, so that we can create any game and customize AI, Player, GameRules, e.t.c.). So basically programming, asset creation and linking everything up together. It is not enough to produce some „mini projects“ or single tutorials. We need an entire production pipeline from start to finish. If anyone is still reading this (like I‘ve mentioned: most people are used to some short input and won‘t even read a text like this one. Maybe even skip some parts), then I want to thank you for taking the time. I hope that my explanations might some day help us to get better training materials. Hi CryEngine team please make a tutorial series on FPS multiplayer game on your YouTube channel. A decent C++ tutorial that covers most of the important things that we will need to learn. And maybe an inventory system?